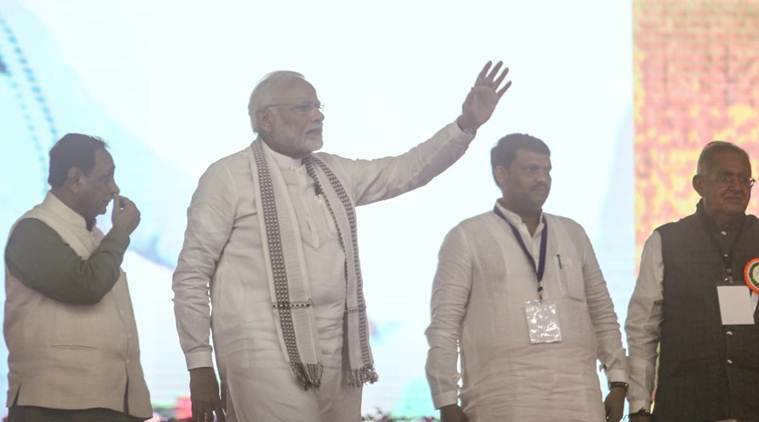 PM Modi in Gujarat LIVE updates: In Jujwa village, Valsad town, Modi witnessed the collective 'e-gruha pravesh' (online house warming) of the beneficiaries of Pradhan Mantri Awas Yojana (Gramin). Prime Minister Narendra Modi attended multiple events during a day-long visit to Gujarat on Thursday. Besides inaugurating several projects, the PM addressed the public in Valsad and Junagad and also delivered the Convocation Address at Gujarat Forensic Sciences University in Gandhinagar. He is expected to attend a meeting of the Somnath Trust before heading back to Delhi. 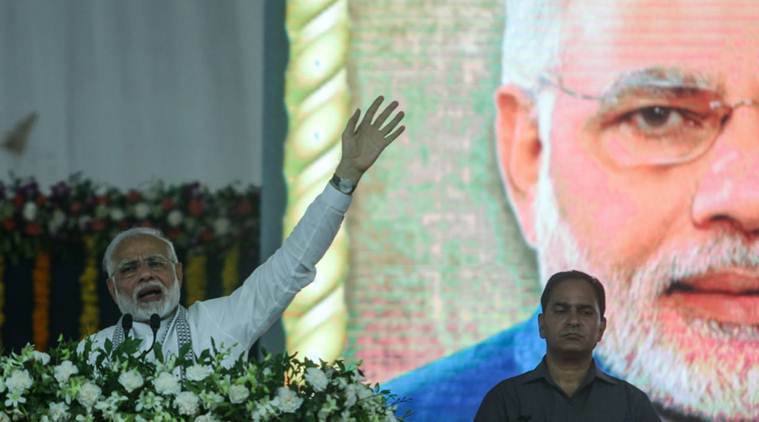 While addressing the crowd in Junagadh, Modi said the country would have been disease-free by now if programmes like the Swachh Bharat Abhiyan were introduced 70 years back. Taking a swipe at the Opposition, Modi said he was mocked for these programmes, which are aimed at making a healthy nation. “There has been a recent WHO report, (which states) that just because of (by ensuring) cleanliness, three lakh children can be saved from dying in India, such is the situation. The Swachhta Abhiyan is directly connected to health,” he said. In Jujwa village, Valsad town, Modi witnessed the collective ‘e-gruha pravesh’ (online house warming) of the beneficiaries of Pradhan Mantri Awas Yojana (Gramin). “While talking to women beneficiaries of the Pradhan Mantri Awas Yojna, I was watching the houses behind them. Even you would be wondering how such good quality houses were built under the scheme,” Modi said, after interacting with some of the beneficiaries in various districts through video conferencing. PM Modi is on a day-long visit to Gujarat. Follow all the live updates as we track him throughout the day. Addressed the convocation of the Gujarat Forensic Sciences University. It was wonderful being among bright young minds, who pursued a line of study that is of great importance in this day and age. Congratulations to those graduating. Modi added, "Swami Vivekananda used to say each soul is potentially divine. Each one of us has tremendous strength that is waiting to be explored. The first step towards manifesting this strength is to believe. Believe in yourself Believe in your abilities Believe in your potential." "Looking at the importance of DNA technology in forensic investigation, our government has approved the DNA Technology (Use and Application) Regulation Bill 2018. Through this bill, we will ensure that all DNA tests remain reliable and the data is safe," PM Modi said. The prime minister is at present addressing the gathering present at the fourth convocation ceremony of Gujarat Forensic Sciences University (GFSU) in Gandhinagar. "When I used to talk about cleanliness, they (Opposition) used to make fun of me. Is this the PM's work... to make toilets, clear garbage? Had all these works been done 70 years back, the country would have been disease-free by now," the prime minister said. Modi added that moving the country towards being open defecation free is the biggest service towards health. He said a programme has been started under which there will be one medical college and a hospital for every three parliamentary seats. Later, (as the programme progresses) the number of parliamentary seats will be reduced to two and then one. "There should finally be a medical college and a hospital in every district (zilla)," the PM said. Attacking the opposition during his address in Junagadh, PM Modi said he was mocked for govt programmes, which are aimed at making a healthy nation. Citing a report of the World Health Organisation, he said lives of three lakh children in India can be saved just by ensuring cleanliness. "There has been a recent WHO report, (which states) that just because of (by ensuring) cleanliness, three lakh children can be saved from dying in India, such is the situation. The Swachhta Abhiyan is directly connected to health," Modi said. Prime Minister Narendra Modi has arrived at Valsad. "In Valsad, laid the foundation stone for the Astole Water Supply Scheme. This scheme will have an extremely positive impact on the lives of the people in the region. By ensuring clean drinking water, it will save several lives from diseases," PM Modi tweeted. "No government cared to take into account the input cost while fixing the minimum support price of crops. I have decided to fix MSP 1.5 times higher than input cost. We have also decided to complete 99 pending irrigation projects at the cost of Rs 1 lakh crore," PM Modi said. Continuing his address, Modi said, "Today, parents keep suffering from diseases as they fear their son will lose his all savings if they were they to seek medical treatment. Under the Ayushman Bharat scheme, the central government will bear the expenses of medical treatment of such people to the tune of Rs five lakh." "The coming of Pradhan Mantri Jan Arogya Yojana- Ayushman Bharat will transform the health sector and ensure the poor get top class healthcare and that too at affordable prices," Modi said. "The Government of India has started Jan Aushadhi stores, which is reducing the prices of medicines. It is important that the poor and the middle class gets access to affordable medicines," Modi said. Speaking on cleanliness, the PM said, "The government's emphasis in cleanliness is being universally appreciated. The importance to cleanliness is important because a Clean India ensures people do not suffer from diseases." "Today I could see the happiness on the faces of those who have been given their own homes," PM Modi said while addressing the crowd on the grounds. While addressing the public on the grounds, Gujarat CM Vijay Rupani said there were six medical colleges in the state during Modi's tenure as CM in 2001. Since then, the state has built nine more new medical colleges, he added. At Junagadh, Modi inaugurated the MGMERS General Hospital by unveiling a digital plaque at a public meeting on Police Training Ground. The hospital has been built by the state government at the cost of Rs249 crore. PM Modi has arrived at Police Training Ground in Junagadh to inaugurate the Junagadh civil hospital among other projects. Modi said his government has the "guts", and when the entire country is watching and the media is present, he can ask the women beneficiaries if they had to pay any bribe or commission to get the houses. "In reply, the mothers and sisters could say with satisfaction that they got the houses according to rules and they did not have to pay a single rupee bribe," he said. "Gujarat has taught me a lot. This lesson has taught me to fulfil dreams within a specific time. It is my dream, it is our endeavour to ensure that every Indian family has its own home by 2022," the prime minister said. In an apparent jibe at former prime minister Rajiv Gandhi who had once claimed that if the Centre releases Re 1, only 15 paise reach the poor, Modi said in his government "if Re 1 goes from Delhi, the entire 100 paise reach the house of the poor". PM Modi will be attending multiple events across the state, he will also address the public in Valsad and Junagadh during the events, deliver the Convocation Address at Gujarat Forensic Sciences University in Gandhinagar and will also attend a meeting of the Somnath Trust before heading back to Delhi.